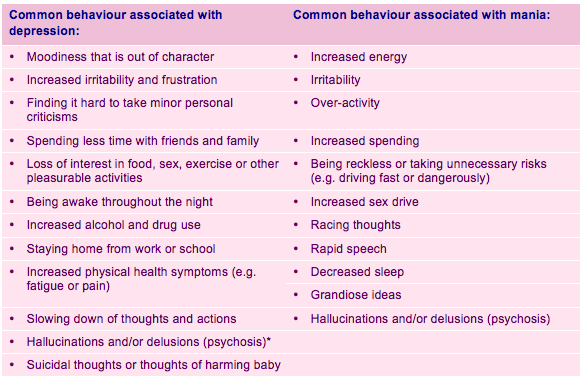 Symptoms of bipolar disorder during pregnancy or in the postnatal period are the same as those at other times. Whether the woman is in a depressed or manic phase, her ability to care for her baby will be significantly affected and she may be at risk of suicide or harming herself or her baby. Some women with bipolar disorder have symptoms of psychosis. These include seeing or hearing things/people that are not there (hallucinations), feeling everyone is against them (paranoia) and having beliefs that are not based on reality (delusions).